Kodansha Comics is the renowned manga publisher of global-hits series like AKIRA, Attack on Titan or Sailor Moon. For Anime-Expo 2016 and San Diego Comic Con (SDCC2016), they invited attendants to join two custom scavenger hunts. The first, a storyworld-specific quest around Your Lie in April. The second, a discovery adventure around manga artist Tsutomu Nihei. Participants seek clues hidden in posters around venues, navigating across partner booths while interacting on SMS with characters and receiving extra content on a dedicated webapp. 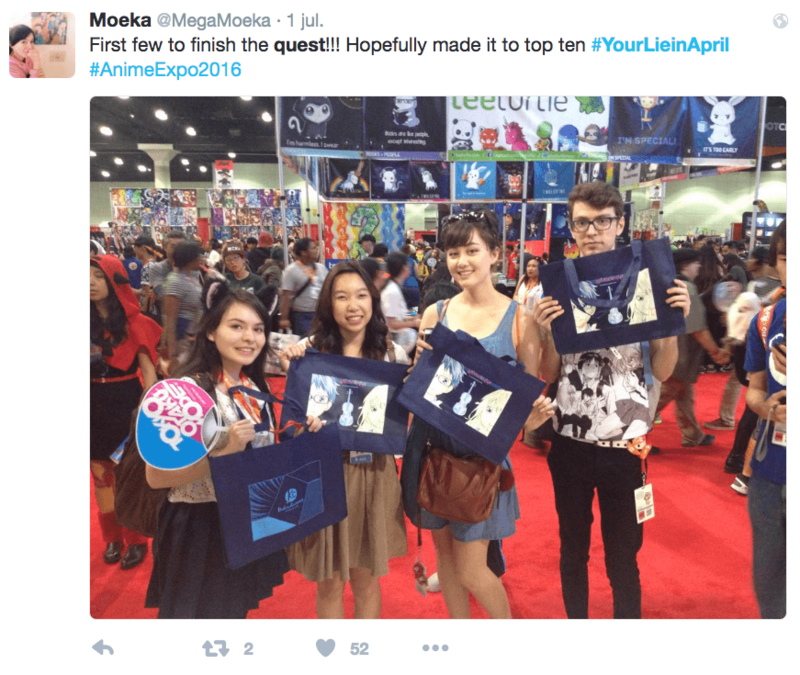 This was a site-specific scavenger hunt for Anime Expo to promote Kodansha’s manga property, Your lie in April. Participants engaged with an SMS quest based upon Your lie in April storyworld, so they got to know the characters and aesthetics of this graphic story. Kousei has lost his passion for music: he’s not able to listen to the notes he plays in the piano, and life is monochrome since his mother died. Can you help him to bring back colors and musical notes to his life? By texting Kousei (main character), audience help him to recover the notes and colors he has lost, by solving riddles and going places that reveal new characters. Each character represents a new color and a new note in main tune, which become badges and extra content on the webapp. When they meet Kaori at the final location, Kousei’s abilities are restored as he finds true love. A leaderboard ranks all participants according to their quest duration, and those who stay in top ten by the end of day collect a YLIA comic book from Kodansha booth. Sweet! 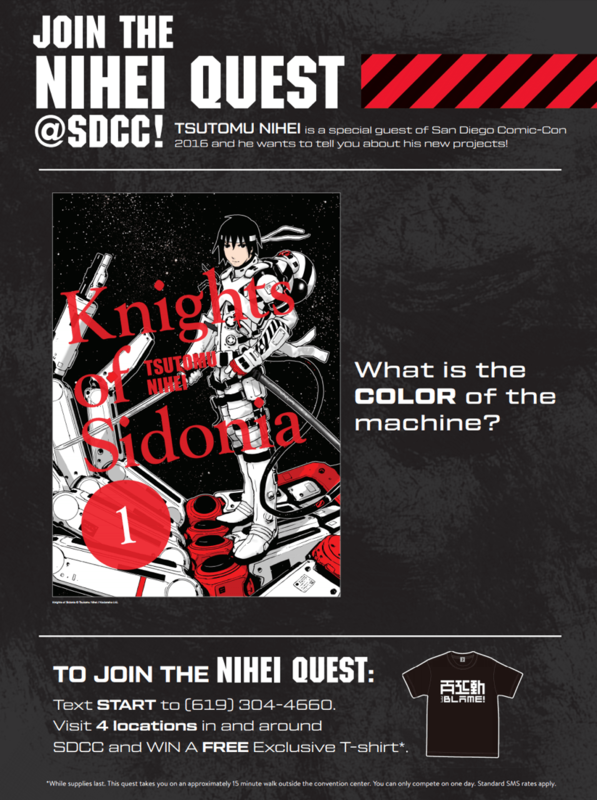 This was a quest designed for San Diego Comic Con, around the life and work of Tsutomu Nihei, special guest to the event. Participants got to know the artist and got the opportunity to investigate his most famous past works (Blame!, NOiSE, and Knights of Sidonia) while learning about his most recent endeavours: a new merchandising brand and a Wolverine saga. Hey, it’s Nihei. Thanks for visiting this place! In here you’ll be able to get to know me and about my works a little better. Let’s start! Users connect with Nihei texting the number found in clue posters, and move around SDCC looking for new clues that allow them to progress through the game. Exclusive videos from Nihei, badges and special shareable artworks are awarded to the most interactive players. These quests were single-player experiences yet participants took the quest with friends, generating word-of-mouth and positive brand sentiment. Player mobile numbers and email addresses were collected allowing for after-event follow-up and swelling the customer database for future newsletter and promotions. Partner booths were delighted with the traffic directed from the game to their booths – creating bonds with new audiences and strengthening Kodansha’s relationship with its partners. Detailed metrics provided insight about user behavior at events, product preferences, and where they had traveled from. Do you have a storyworld? Let us build or create your own interactive quest for your audience to experience it!